I hope the weather is warming up where you are. 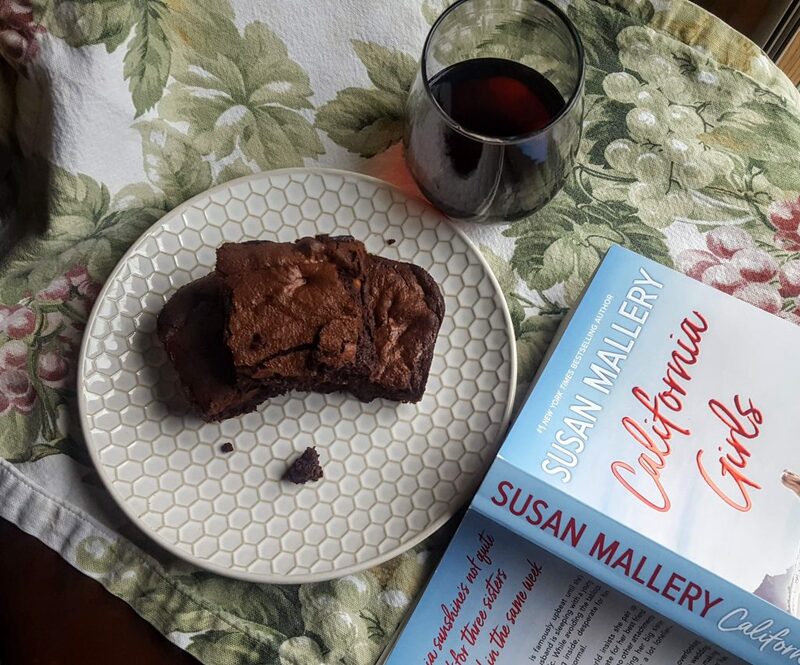 It’s time for another TLC Book Tours and this one will get us ready for summer, California Girls by Susan Mallery. 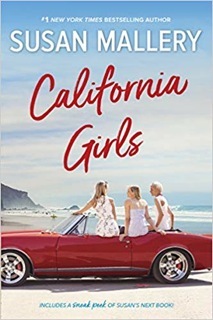 California Girls is a chick lit, rom-com novel. (Not that there’s anything wrong with that.) 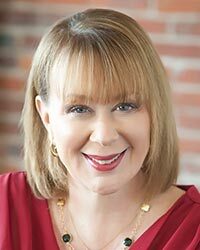 Mallery creates a family of modern California girls—a local TV celebrity, an OR nurse, and a warehouse manager. They’re all sisters with a mother to write home about. Mom is so desperate for her girls to be in relationships that she sets her straight daughter up with a lesbian acquaintance. This same said mother immediately accuses one heart broken daughter of causing her engagement and impending wedding to be cancelled. She asks the other daughter (whose husband is cheating on her) what she is doing to win him back. I thought the idea of three sisters going through major breakups at the same time was a good premise for a novel; however, Zennie, the OR nurse, was never really in a relationship (like ever) so that idea fell flat for me. I did enjoy the ending, however. There was a brief moment where I thought Mallery was going to add in the “we have to break up because you’ll be happier” moment. Luckily it was only a line or two. I was also glad to see that not all the sisters had to find a man to be happy and fulfilled in the final pages. If you’re a romance lover, you will probably adore this novel. There’s lots of alcohol references (to block out the breakup despair), pizza and cheetos and other comfort food (also used as an escape). At one point, Ali, I believe, is craving (or is actually eating and imbibing) brownies and wine. 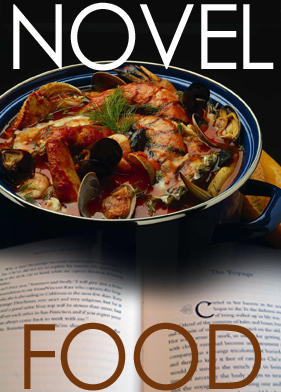 I immediately thought, “Well, that’s a novel idea!” A few Google searches later and I had an idea of the perfect food pairing for this book! By Debra with nods to Broma Bakery. 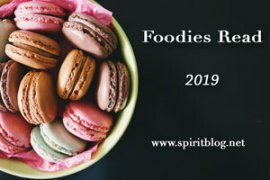 Red wine and chocolate—what more could a girl want? Preheat oven to 350°F. Prepare an 8 x 8″ pan with cooking spray. Set aside. Place the butter and the chocolate chips in a large glass measuring cup or glass bowl. Microwave for about 45-60 seconds, stirring after 30 seconds, until butter and chocolate are melted. Place brown sugar in a standing mixer with a paddle attachment. Slowly pour melted chocolate mixture into brown sugar with the mixer running on medium speed. Add in eggs, one at a time, continuing to beat. Beat for 30 seconds, until the color of the batter lightens just a bit. Turn the mixer to low and add in cocoa powder, flour, salt, vanilla extract, wine and walnuts. Mix until just combined (about 30 seconds). Pour batter into prepared pan and bake for about 40 minutes, or until a knife inserted in the center of the brownies comes out mostly clean. The wine added just a hint of floral overtones. If you like the ooey-gooey variety of brownies, you will love this recipe! Check out what others on the tour thought about California Girls. For all my TLC Tours, click here. the book is not my kind of reading style I think, the brownies, however, love the idea of them with a bit of red wine. Would add a nice complexity tot eh taste. Yum! Yeah, I probably would not have picked up this book on my own. It was a fun read and directed me toward these brownies though! Chocolate and wine is perfect pairing, but I never would have considered to actually make the brownies with wine. I love the idea. I thank the author for prompting me to make these! Brownies are one of nature’s most perfect foods. A bit of wine could only improve them! 100%!!!! I think brownies are the most perfect food! Ha! They definitely needed to give mom some wine! Maybe that would have mellowed her out. I love brownies with red wine, but would never have thought to put the wine in the brownie batter. These brownies look awesome! Is it weird that I want to still read this book even with the mom being ridiculous? Kind of reminds me of Lizzie Bennet’s mom. I’ve seen so much of Mallery lately that I need to read one of her books. Those red wine brownies are a genius idea. Looks delicious too! Like I said, it’s a quick read. There was some interesting parts, that is for sure. 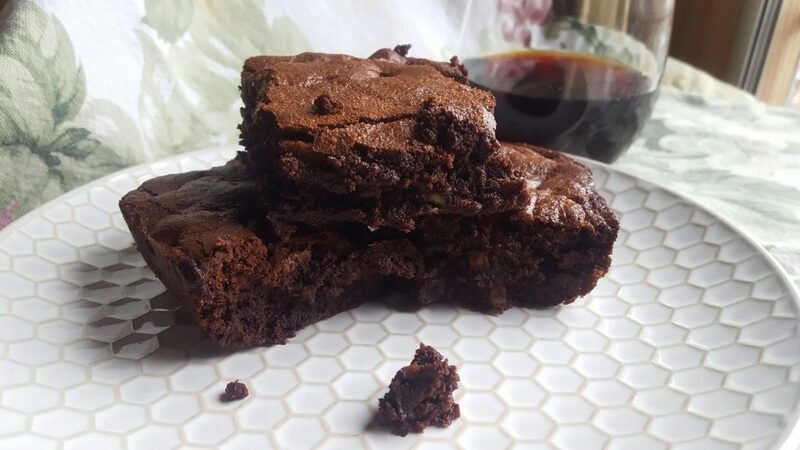 never thought about using wine in brownies…. Me either. It was a win, though. Sometimes you need a read that doesn’t take a lot of brain power. That’s when I grab one of these kinds of novels. The brownies would definitely help make the book go down easier LOL. I agree. It’s nice to not have to dissect.